This is the full list of comments people made about problems with kitchen equipment in food tech and cookery classes. A left handed peeler would have been really nice and a decent can-opener would have made life that little bit easier. As for knives, I've only ever used right-handed ones so I'm kind of used to the undercut you get. Adapted to and continue to use Right handed kitchen equipment. all the time, can openers are the worst. As a cook I learned to use right-handed tools. As an experienced cook, I refuse to pay premium prices for left-handed equipment. At school they did have a mixture of left handed and right handed peelers but I would often have to swap with someone. Being married to a right hander, he always complained that the kitchen was set up backwards. Especially when he went into a drawer for a knife. He always had to pick it up by the blade! Poor dear, I finally made a lefthanded knife grabber out of him!!! Can openers and peelers were the worst. It was impossible to look cool in front of the girls in Home Economics class when your struggling like a spaz opening a tin of tuna. Edward's cooking at school generally doesn't involve tin openers, but he has used peelers and knives that were right-handed in his left hand. However, at home he and his sister use left handed vegetable knives, peeler (two sorts as they prefer differ net ones)and tin opener. At Alice's secondary school there was no manual left-handed tin opener available and the electric one she was told to use wasn't working. To set around these issues she prepares much of her food for the lessons at home where she has access to the correct equipment. Even at home I hate right handed can openers. they are so hard to use I want to put them so they are the right way for me but they don't work. Ever since I was a kid, I used to really struggle to use kitchen equipment, especially tin openers! I have therefore had to adapt myself to using right handed equipment. have to train my self for using the right handed utensils as there were no left-handed available. I cannot use right handed ice cream scoops! I cut my self in the kitchen almost every time I picked up a knife. I was laughed at and called a clutz. I did home economics and there was nothing for lefthanders. I still use a knife to peel potatoes and with carrots peel up towards me which is more dangerous, as I can't use peelers. I do food tech and whenever peeling something is required I have to ask someone else to do it for me - I have great difficulty using a right-handed peeler! I do use a dual handed potato peeler. I don't think ALH had ever been heard of in Widnes, Cheshire when I was at school - only just acquired my first LH knife in September. Totally fab! I either adapted or was naturally right handed with some of these tools. When I was growing up I had to help with the dishes. It wasn't until I had my own place that I realized mom had set it up for right-handed people. When I commented on it she said, "I hoped you wouldn't figure it out." Ha! In my kitchen, we do dishes the left-handed way and the righties just have to deal with it. I find this quite difficult, so these things can take a long time, which is a big problem when you don't have very long to cook. I either have to struggle with the knives/can openers for a long time, or wait until a right handed friend is able to help me which delays both of us. I had to adapt to everything the first unihand potato peeler was available when I was 13 I bought it as up to then I had to use a sharp straight edge knife or get someone else to do it. However I do work as a chef now. I had to adapt when studying food tech, learning to cut with right handed knives, although I was frequently cutting myself. i had to bring in my own tin opener or get a right-handed friend to open cans for me. I have also never taken this. But I have had to adapt in my own home kitchen. I have both a left handed can opener and a right handed one. That way if I can't find the lefty one I know how to use the righty one. I have bought my own tools, but while in school, I had to burn my hand like all the other lefties. I have found a few left handed kitchen tools, but mostly I've adapted to using right handed tools in my left hand. I have not taken any of these classes, but I have cooked at home. I have to constantly use righty can openers, and knifes because they do not supply the lefty ones. it is very hard to adapt and decreases my grade because they take me more time to use. I am not able to use such products quickly. I have used left-handed knives, etc. when I lived on my own. Now, I live with my mother who is right handed, and I have to use all her right-handed equipment. 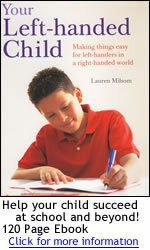 I mentioned this above, but like I said the left-handed teacher got on just fine. I normally use ring pull tins, but my cutting is very wonky with the right handed knives. The peelers are the worst thing to use if they are the wrong way round though. I now have left handed utensils in my kitchen which is great for me. The rest of the family finds it difficult. I really didn't need to ADAPT because I am ambidextrous. I still have trouble with slanted spatulas! I took food tech and found it difficult to peel vegetables or fruit using my left hand - there was no alternative peeler for me to use. I used to take in my own peeler, all others I learned to adapt. I usually prepare any food at home with left handed products. I'm still working on getting the proper tools for cooking. It took my until I was about 13 to master a tin opener! I've been taught to do things with right handed equipment and only recently realised that there was more out there to help left handers; I never used to realise that there were left handed knives because no one had ever told me, so I just adapted. I've only ever used a left-handed tin can opened once at school and I believe it was available because one of the kitchen workers needed it. Just got on with it. Once had to make a crumble so my mum sent me to School with rhubarb so all I needed to do was wash it and cut it - but to this day we do not know why my teacher made me peel it - just to make it awkward I am sure. I still pity my poor dad who had to eat a slime green crumble ! Knives and can openers are the most difficult. Luckily I didn't have those classes in school, but other people did. measuring utensils are a pain, the conversion I want to use is on the opposite side. Most peelers are built for both hands these days, I can never remember having any problems with any type of knife, I have both left and right handed knives at home and find it is the cutting technique used rather than the orientation of the serrations that matter. My wife who is right handed cant cut bread to save her life with either type of knife, whereas I have no problems with either type. My Daughter tells me no special equipment was provided. My mom found me a left-handed offset butter knife that was the yearly joke at holiday family gatherings. Now I have my own darn kitchen utensils. other options are not given!! peelers and equipment are both right and left. Peeling a potato is really hard to do if they don't have a multi-way one! Potato peeler is the only thing I notice in the kitchen. Also, the formal butter knife isn't for me. I try to use it with the right hand. still can't cut an onion properly. Still do mostly. Even the "universal" tools don't seem to work as well left handed. The left-handed tin openers have always been quite a hassle because I have to put my hands in a very awkward position to use them, and afterwards I am in pain. The only L-H items I use are at home & only if I buy them myself. They had one left-handed can opener and it was broken so the other people in my group had to open the cans. Twenty years ago I just had to get someone else to open tins at school. People thought I was weak. People still think I'm being weak if I tell them I can't open bottles of wine myself! Typically, any of those classes I have taken all use right-handed devices. Uses cutlery normal way round, but not comfortably! Usually got a teacher or helper to do it for me.